The item on the right in this figure should look familiar to those of you who use an iPhone, iPad, or iPod touch. It’s the Mac Notification Center, which was introduced in Mountain Lion but was included in iOS before that. A reminder on a Mac displays as an alert banner (top left) or in the Notification Center’s Today tab (right), and on an iPhone lock screen (bottom left). 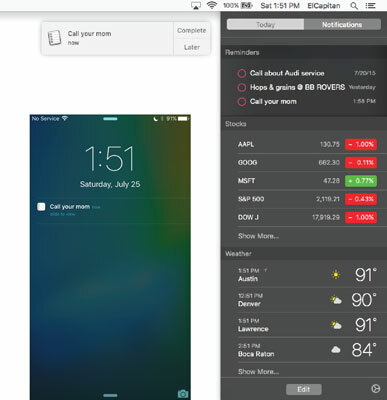 Notification Center manages and displays alerts from apps that support it. You can make it appear regardless of what application is currently active by clicking its menu bar icon (shown here) or swiping from the very right edge of the trackpad to the left with two fingers. To have an app’s notifications not appear in Notification Center: Deselect the Show in Notification Center check box, or drag the app down to the Not in Notification Center section of the list. 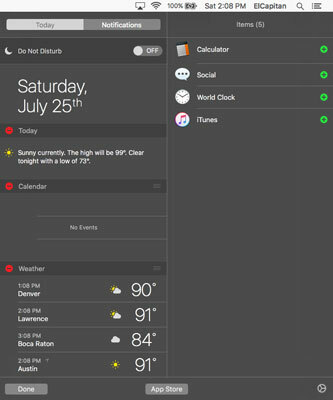 To change how apps are sorted in Notification Center: Choose Manually or By Time from the Sort Notification Center pop-up menu. Choose Manually if you prefer to arrange the order the apps appear in Notification Center by dragging them up or down (my preference); choose By Time to sort them with the most recent ones at the top. To specify the alert style for the app: Your choices are Banners, Alerts, or None. Alerts stay onscreen until you dismiss them; Banners appear in the upper-right corner of the screen below the Notification Center icon and fade away a few seconds after they appear. To see the number of new notifications for the app on its Dock icon: Select the Badge App Icon check box. To hear a sound when receiving notifications: Select the Play Sound when Receiving Notifications check box. To specify the number of recent items that Notification Center displays for the app: Click the Show in Notification Center pop-up menu and choose 1, 5, 10, or 20 recent items. There’s one more item in the Notifications System Preferences pane worth mentioning: the Do Not Disturb button, at the top of the list of apps. Click it to temporarily silence alerts and banners during the specified hours. Or temporarily enable Do Not Disturb: Option-click the Notification Center icon on the menu bar, which will turn gray to indicate that alerts and banners are suspended. Option-click the Notification Center icon again to disable Do Not Disturb. The Today tab (refer to the figure, right) is sweet, offering a helpful list of upcoming events, reminders, weather, stock prices, and other information you may find useful. To manage what you see in the Today tab, click the Edit button at the very bottom. The Today panel slides to the left to reveal a list of additional items that you can add to your Today panel, as shown here. While these items are visible, you can change the order of items in the Today tab by dragging them up or down in the list. Click the green + buttons to add Calculator, Social, or World Clock, or iTunes to the Today tab of Notification Center. Before you leave Edit mode, you might want to check out third-party items (widgets) for your Notification Center by clicking the App Store button at the bottom. When you’re happy with your Today tab, click the Done button. To respond to a notification: Click the banner or alert before it disappears. Or, open Notification Center, click the Notifications tab, and then click the notification to launch its app. If you hover the pointer over banners, you may see additional options such as the ability to reply to an email or message without launching Mail or Messages. Give it a try! To repeat a notification in nine minutes: Click its Snooze button. To close all notifications for an app: Hover the pointer over the right side of the app’s name in the Notifications tab (iTunes in this figure) and click the little x when it appears. Click the x to close all notifications for the app.